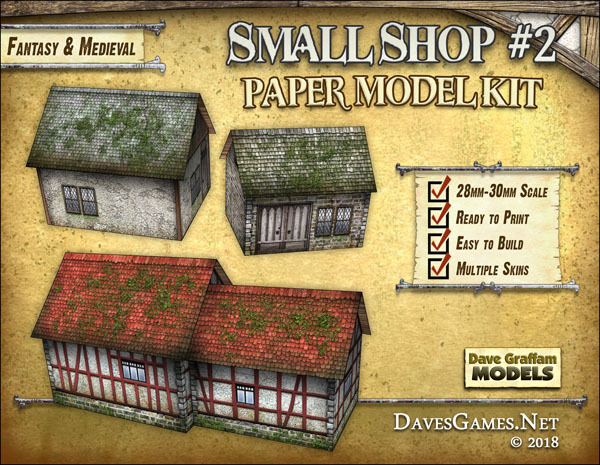 This simple but versatile model kit is designed to be the perfect way to start a scale-model village or fill in gaps in your terrain layout. This paper model kit is easy to assemble, requiring just a few cardstock paper sheets to print on (110 lb. or 199gsm recommended), scissors, hobby knife, paper glue, metal ruler and cutting mat. Step by step instructions are included. The Small Shop #2 features multiple texture layers, putting you in control over the final look of your model before you print. If you like, you can print several versions of this model and scatter them around your gaming table, and each model can have a distinct look. This kit includes all of the PDF files you need to print and assemble 2 separate shops, or a longer shop structure made up of 2 or more cabins.